The Love That Dared Not Speak Its Name, Of A Beetle For A Beer Bottle : Krulwich Wonders... What's that beetle doing to that beer bottle? The beetle dropped down from the sky, grabbed the bottle's bottom, keeps hugging and hugging it, even when being attacked by ants, and it won't — refuses to — let go. It can't be the beer it's after. The beer is at the other end. What's going on? It was early September — that's springtime in Western Australia — and two young biologists, Darryl Gwynne and David Rentz, were on a field trip, wandering dirt roads near the highways, looking for insects, when one of them noticed a loose beer bottle lying on the ground — not so unusual in the Dongara region, where Australians zooming by often launch beer bottles from their car windows. This particular bottle was a "stubbie," squat, 370 milliliters, colored golden brown. When the two looked more closely, they saw something extra, hanging on the bottom end. It was a beetle, and it was fiercely gripping the glass. They shook it, and it wouldn't fall off. It wanted to be there. Looking even closer, they recognized it as an Australian jewel beetle, and looking closer, they noticed it had (as they wrote later) its "genitalia everted — attempting to insert the aedeagus," which is a very polite way to say they were looking at a beetle attempting to mate with a glass container. Clearly, this was a very confused individual. But then they found three more stubby beer bottles, and on two of them, surprisingly, were more male beetles, also "mounting" their bottles. That makes three frustrated males. Hmmm. That got them interested. So they wandered about, found four loose stubbies, and placed them side by side on open ground where they could be seen by any male beetles flying overhead. "Within 30 minutes," they wrote later, "two of the bottles had attracted beetles. In total, 6 male beetles were observed to mount the stubbies. Once on the bottles, the beetles did not leave unless displaced by us." More surprising, Gwynne and Rentz found one beetle hanging onto his bottle even while "a number of ants" were busy biting "the soft portions of his everted genitalia" — and still he stuck to his business. This was not just a pattern, this was a mission. 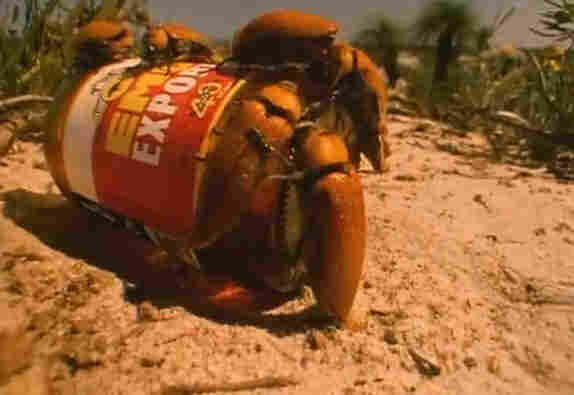 What, the two scientists wondered, could explain these beetles' superallegiance to Australian beer bottles? It wasn't the beer. These males didn't gather at the spout end, and the bottles, the scientists said, were long dry. 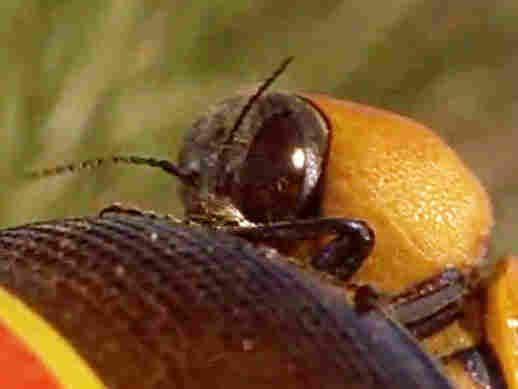 The answer became obvious when they got a close look at a female Australian jewel beetle. Females, as it happens, are golden brown. They are big — much bigger than the males. But most important, they are covered, as you see here, with dimples, little bumps. 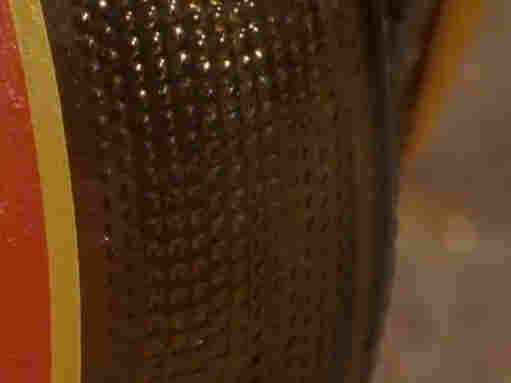 Australian beer bottles at the time (this happened in the 1980s) were also big, also golden brown, and down near the base they also had little bumps, arrayed very much like the bumps on a female jewel beetle. Clearly, Gwynne and Rentz wrote in their paper, the males were unable to distinguish between beer bottles and lady beetles. They thought — or rather their inner wiring told them — they were mating. This is what biologists call "an evolutionary trap." It's what happens when birds, turtles, moths, beetles, all kinds of animals, wired to respond to certain cues in nature, bump instead into human inventions and get confused. They try to do the right thing — like having a little baby beetle, and end up spending hours scraping glass. When sea turtles finish laying eggs on beaches, they look for moonlight over the ocean. The light tells them which direction leads back to the sea. Hotels with big lights on their end of the beach can confuse mother turtles, making them go the wrong way. Some hotels now douse their lights when sea turtles come to lay their eggs. There are so many examples. Farmers in the Midwest used to put red insulators on their electric fences. Hummingbirds thought they were red flowers. If they touched the wire with their beaks, they died. The insulator company, when it realized what was happening, stopped using red paint, and farmers eventually substituted not-red models. As the world gets more crowded, some humans are learning to try — at least some of the time — to be less of a nuisance to other animals. That, happily, is how our jewel beetle story ends. 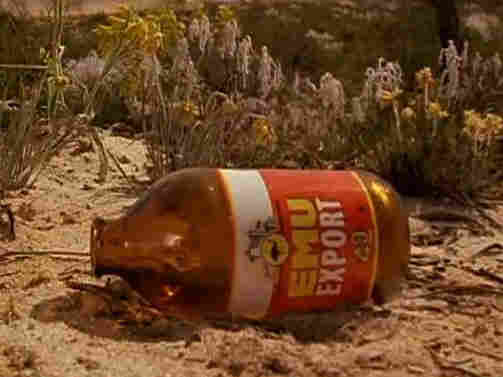 When beer companies in Australia learned that their bottles were having a discernible effect on the population of jewel beetles — so many males were spending useless hours fornicating, often dying under the hot Australian sun and leaving no heirs — the companies decided to change their bottles. The little bumps were eliminated to be replaced by smooth glass, the beetles lost all interest in bottles, and life in the Australian west — at least beetle life — went back to normal. The problem is, this problem doesn't end. Humans keep inventing things. Animals keep bumping into these things, sometimes with very unhappy results, and we have to keep correcting our mistakes. That's one reason we've been given the big brains, I suppose, to help us undo the many things we've done when didn't even know we were doing them. An Armadillo singing ... to an armour-plated tank. This - abandoned on manoeuvres - is the object of your love? About the one that he adores. 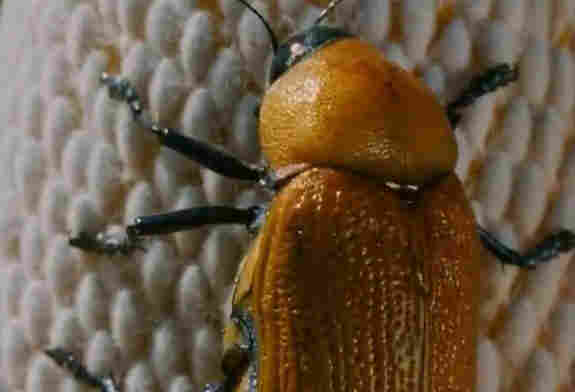 And to further celebrate my theme, for those of you who want to see beetle/bottle footage from Australia, here's a BBC video which would be X-rated if you were an underage beetle unaccompanied by an adult. A previous version of this post incorrectly gave Darryl Gwynne's first name as Dwayne.